By the end of the first decade of the twentieth century, the days of uncertainty about Phoenix' water supply were quickly coming to a close. With the completion of Roosevelt Dam in 1911 imminent, the future prosperity of Phoenix was assured. By 1910 the population of the Valley had nearly doubled over the past decade to more than 10,000 residents. This rise in population brought about a rapid shift in the economic makeup of Phoenix, transforming it from a primarily agricultural region to a retail and industrial center. Over the next ten years, Phoenix grew quickly. Sewer lines were laid, roads were widened and paved, municipal utilities were established, and businesses of all types entered or expanded into the city. It was during this period of extensive growth that many of Phoenix' first subdivisions were constructed and annexed to the city. The Woodland District's history marks the beginning of expansion of the original Phoenix townsite. In 1880, the first addition westward of the original Phoenix townsite was surveyed by Herbert R. Patrick and recorded by David Neahr. This quarter section of property between 7th and 15th Avenues, south of Woodland Avenue and north of Gray Avenue became know as Neahr's Addition. 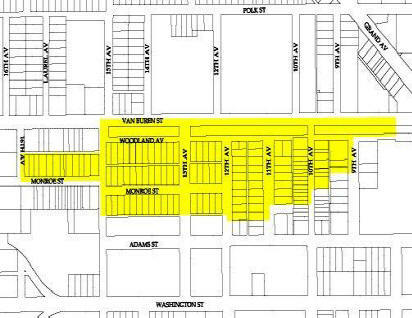 The area now designate4d as the Woodland Historic District was developed in the early 1900's through a replanting of three blocks in the northern section of Neahr's Addition. Today the Woodland District is significant because it is a representative of Phoenix residential planning and expansion in the early twentieth century. Bounded by 13th and 15th Avenues on the east and west, and by Woodland and Adams on the north and south, the area contained 48 lots. Little building took place in the area until a housing boom in 1913-1914 almost filled the subdivision with Bungalow style houses. Woodland Place forms the western edge of the Woodland Historic district. Also recorded in 1893 was Gray's subdivision - 24 lots facing 10th Avenue between Woodland and Adams. This subdivision took longer to develop and it was not fully build up until the nid-1930's. Gray's Subdivision is the eastern portion of the Woodland Historic District. Three other subdivisions make up the remainder of the district. Walker's Subdivision, Athena Place and El Fresnal were recorded in 1806, 1910 and 1913 with 24, 20, And 10 lots respectively. The original developers of the Woodland neighborhood were influenced by the Beaux Arts concept of city planning, which included formally designed suburbs with extensive parks and boulevards. This planning philosophy, which was popular from 1885 to `93, was responsible for the 1913 development of Woodland Park, on of Phoenix' earliest city parks, Designed to separate the residential areas along Woodland Avenue from the commercially oriented Ban Buren Street, Woodland Park continues to be a significant element of character of the Woodland Historic district. 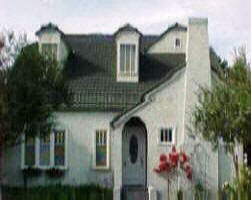 Bungalow is the dominant architectural style found in the Woodland Historic district. Bungalows have simple, functional, one-story floor plans with broad front porches and broadly pitched overhanging roof gables. Bungalows in Woodland are characteristic of the style can contain many good examples of craftsmanship. 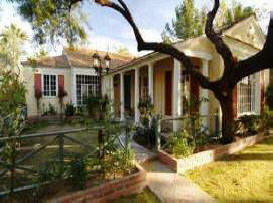 Typical of many of the historic districts homes in Woodland date from as far back as 1885 to the mid-1930's. As the first development to occur outside the original townsite, Woodland is historically important for its representation of the forces that shaped Phoenix at the turn of the century. The district's location, and layout provide physical expression of the concepts and practices that transformed the early settlement into a regional center. Although limited in number and modest in scale, the houses of the Woodland Historic district are important for the range of building periods they represent, and as example of historic construction methods, material and workmanship. Of particular note is the Eyrich House, located at 1015 West Woodland. 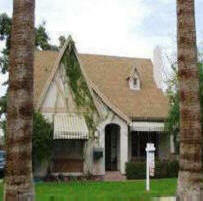 Built in 1885, it is one of the oldest buildings in Phoenix today.